Dr Jacqueline Mardon is an Associate Specialist and the Clinical Lead at the NHS Centre for Integrative Care in Glasgow and recently took on the role of Secondary Care Representative for the Faculty. She has been learning and practising homeopathy for the past 21 years. 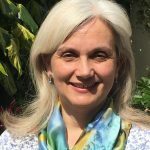 Particular interests include Allergy, working with artistic therapies such as music and art, and she has a background in Anthroposophic Medicine. She completed a Fellowship in Integrative Medicine with the University of Arizona in September 2015. She favours a collaborative approach integrating arts, including poetry and movement, in medicine.